In week 1, Accumulation week, you can see there are 5 sets to be performed of each exercise. 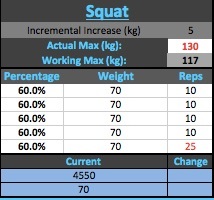 The percentages for week 1 are all 60%, and the calculated weight will be displayed (in this example its 70kg on the squat). The number of repetitions for the first 4 sets is 10, and the 5th set is “AMRAP” Your objective is to perform As Many Reps As Possible (definitely more than 10 and hopefully more than 20) on the last set, enter the total repetition in the “AMRAP” field. You will repeat this for all 4 exercises in week 1. 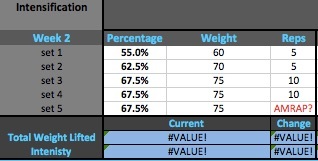 In week 2, Intensification wave, you will notice that the percentages, weights, and number of repetitions are different. Your goal again is to AMRAP the 5th set and enter in the total number or repetitions performed. Again you will do this for all 4 exercises in week 2. In week 3, Realization phase, you will be lifting the heaviest percentages along with the lowest number of repetitions for this wave. Again all of the sets and repetitions have been calculated for you. The only task you have left to do is AMRAP the last set and enter how many repetitions you SMASHED out. While we are in the 10’s phase (first 4 weeks) you should (MUST) be able to achieve more than 10 reps on all the AMRAPS. If you fail to do this you have overestimated your 1RM’s and you’ve failed the programme. You must get the weights right at the start of the programme if you are going to continue to make GAINZ over the 16 weeks. The AMRAP must be UNBROKEN repetitions. It is not doing 10 squats and then stand at the top for 60 seconds until you catch your breath. It’s an UNBROKEN effort people! You may do 10reps and then stop for 1 breath, but then you MUST continue your repetition on the next breath. Cheating the repetitions will result in a score (number of repetitions) that will make your next wave EVEN HARDER. You will be stealing your own GAINZ by cheating here. You will see multiple tabs at the bottom of the spreadsheet. Each tab represents the 4 waves that we will be doing over the next 16 weeks. The total number of repetitions you perform in the last set of the Realization phase will be used to calculate a new working max for the next wave. The more repetitions you pump out in the AMRAP the higher the working max will be in the next phase. The spreadsheet will automatically calculate this value for you and insert it into the “New Working Max” field of the next tab. **The 2.5kg increment is the smallest weight increase we will use for legs and we will use 1.25kg plates increment for the upperbody exercisesin this calculation. To save time and make the most out of the JM training protocol download the spreadsheet and know your numbers before you head to class. The percentages and details will be on the board, however there is limited time in each class to get the job done. Being prepared before the class will give you more time under the bar and less time on the calculator.